What Species of Classical Liberal are You? Do you want to know what offshoot of classical liberalism you most closely line up with? If so, you are in the right place to find out? Whether you're an objectivist, a minarchist, or an anarchist, you'll have a better idea once you've taken this quiz. While it is plausible that there could be flaws in this quiz, it will likely be able to tell you fairly accurately what your beliefs are closest to, whatever that means. 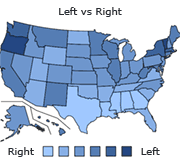 Do you consider your views right- or left-wing? Which of these people do you think has (or had) the best ideas? How do you feel about alliances with conservatives? It's a great idea; conservatism and libertarianism are two sides of the same coin. It's not ideal, but they're not as bad as the left, and the enemy of my enemy is my friend. Even if they are better than the left, their reverence for tradition is a threat to capitalism and individualism. They aren't any better than the left; it likely isn't worth the time. What is the greatest threat to liberty? What is source of the Non-Aggression Principle (NAP)? Feel free to do your own research is you don't know what it is. It is derived from one's Natural Rights. There are no Natural Rights; the NAP is derived from the fact that anything which opposes, destroys, or negates man's reason is evil. I consider myself to be a libertarian. The ultimate goal is the night-watchman state: a government which protects property claims and individual liberties, but otherwise stays out of the way. Because power corrupts, there can never be a night-watchman state, as those in power over others will inevitably seek to exploit them. The primitive way of life is marked by superstition, collectivism, and poverty, and it can only be cured by Western civilization, which will bring reason, capitalism, and prosperity. The feminist movement has had an overall negative effect on society over the course of the last century. An action is rational if and only if it maximizes self-interest. The only system which is compatible with individual rights is laissez-faire capitalism. People should participate in the gray market (economic activity unapproved by the state) and the black market (illegal economic activity that doesn't involve coercion, theft or violence) in order to slowly starve the state of resources, thereby causing it to fall apart. Copyright is unnecessary and detrimental to the market and innovation. The use of political parties and electoral politics is a practical method for establishing a free society. Quiz topic: What Species of Classical Liberal am I?